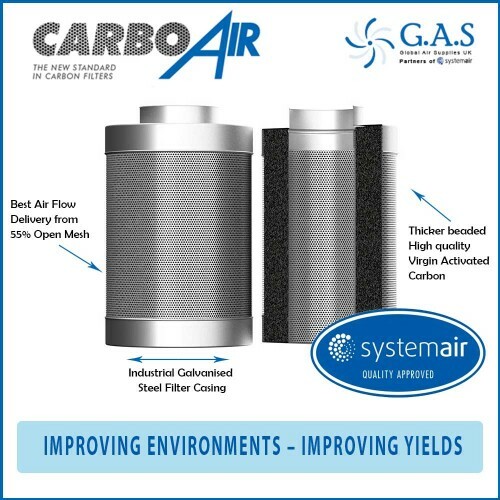 CarboAir 60 Carbon Filters has been developed as we have found higher concentrations of VOCs in the exhaust air from medium and larger grow environments with stronger strains. 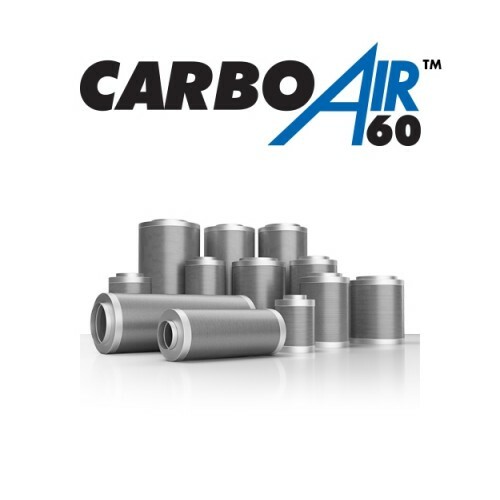 CarboAir 60 carbon filters has a deeper carbon bed of 60mm and a longer body. This provides a longer contact time between the air and carbon removing higher concentrations of VOCs. The 60mm carbon bed of virgin activated granular carbon has been developed to last under harsher conditions. Carboair carbon filters have been designed to perform for a minimum of 18 months. With stronger strains you are safe with CarboAir 60. We are very proud of our industrial galvanised steel filter casing. Using the highest quality materials enabled us to produce the finest mesh. The filter mesh is 55.5% open for the best air flow through the filter. Our filters have better flow rates, enabling us to utilise a thicker carbon bed compared to our competitors. The filter mesh we chose means we don’t need to use an internal nylon mesh that slows air flow, unlike our competitors. The carbon we use has been tailor-made for CarboAir to extract odour from air and work in unison with our fine zinc mesh body. Our virgin carbon is activated at temperatures above 1000°C in a humid environment. The process opens the pores of the carbon to give it incredibly high absorption properties of organic particles and other airborne pollutants. The carbon is produced to very high standards in Europe, unlike Chinese filters which often contain cheaper blends and risk water contamination during shipping. Being produced in the EU enables better quality control. Our carbon is produced to EN12915 which means it is pure enough to be used in food and drink applications. The size and depth of our filter has been specially designed to provide the correct contact between the contaminated air and carbon.